The veiled chameleon (Chamaeleo calyptratus) is found in Yemen and Saudi Arabia. There are feral populations of veiled chameleons in Hawaii and Florida because of the pet trade. Sometimes the veiled chameleon is known as the Yemen chameleon or the cone-head chameleon. The veiled chameleon’s most distinctive physical feature is the large crest on the head. This crest is called a casque. The casques on baby veiled chameleons are just small swellings. On adults, casques can be up to 5 cms (2 inches) tall. The exact purpose of the casque on the veiled chameleon is unclear. It’s believed male veiled chameleons have bigger casques than females so they can threaten other males and attract mates. Veiled chameleons are born pastel green. As they mature they sport brighter colours like green, turquoise, yellow and tan. Adult male veiled chameleons have bright prominent vertical stripes on their bodies and casques. Adult female veiled chameleons have a more muted and mottled appearance. In addition to colour and pattern, there is a size difference between male and female veiled chameleons. 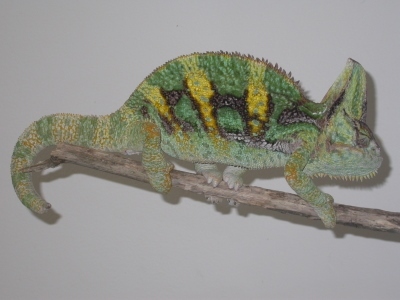 Adult male veiled chameleons can grow to a length of about 40–60 cms (16-24 inches), tip to tail. Adult female veiled chameleons are smaller than males, growing to a typical maximum of 33 cms (13 inches). Female veiled chameleons have stockier bodies than their male counterparts. Despite popular belief, veiled chameleons can’t change into any colour to adapt to their environment. Veiled chameleons change their colour to communicate complex messages regarding their emotional and physical states. Research shows that veiled chameleon have 14 distinct areas on their skin which can change colour independently. Male and female veiled chameleons also communicate different messages when they change colour. E.g. female veiled chameleons will change colour to signal if they want (or don’t want) to mate and if they’re pregnant. E.g. Male veiled chameleons will change colour when they’re trying to attract a mate or when they’re being aggressive. Researchers suggest colour change in male veiled chameleons can help predict who will win a fight. Veiled chameleons are omnivorous, meaning they eat both plant and animal material. Veiled chameleons mostly eat insects, but to get extra hydration they’ll also eat leaves, blossoms and young shoots. Their habitat is shrinking so wild veiled chameleons have moved into agricultural areas and are eating millet. As they are slow-moving reptiles, the veiled chameleon’s hunting style is to hide and wait for his prey. The veiled chameleon’s eyes can rotate 360 degrees and move independently of each other to help him find prey. Their long tongues shoot out at a fraction of a second, allowing veiled chameleons to remain still while catching prey. With proper care, male veiled chameleons in captivity can live between 6-8 years. Female veiled chameleons have a shorter lifespan than males, living between 4-6 years. Female veiled chameleons live shorter lives because producing eggs depletes their energy which impacts their life span.